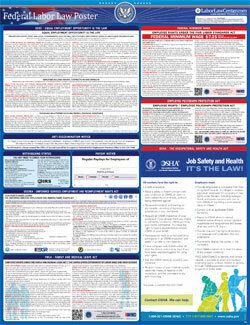 The Your Rights under USERRA is a workers rights law poster by the Federal Department Of Labor. This is an optional poster, so while it is recommended that you post this if it is relevant to your employees, you are not required to by the Department Of Labor. This poster describes the protection that those who leave employment positions to join the military receive. Information on rights such as having the right to be reemployed in a civilian job, the right to be free from being discriminated against for military service, healthcare while away from home and where to go if rights are violated under USERRA. It appears you don't have a PDF plugin for this browser. Please see the link below to download federal-userra-private.pdf. and employers may meet this requirement by displaying the text of this notice where they customarily place notices for employees. from discriminating against past and present members of the uniformed services, and applicants to the uniformed services.